Helped avenge Cayde-6 by assisting in the assassination of Uldren Sov. "When you think about everything we've seen, everything we've done, I feel like I've made the right choice"
The Ghost (sometimes called Little Light) is the robotic companion and partner to the Guardian. Centuries after the collapse, a Ghost scouring the ruins outside of the old Cosmodrome finds its Guardian among the ancient remains and resurrects them just as a band of Fallen begin encroaching on their position. Ghost leads the Guardian through The Wall in search of a Jumpship before helping them return to The City. At the Tower the Guardian is acquainted with the merchants and Guardians who reside there. The Guardian then returns to the Cosmodrome in order to find a Warp Drive which will allow them to join the fight beyond Earth. After finding one in Fallen hands, the Guardian defeats the Devil's Archon and gains an audience with the Speaker who confides in them that the Darkness is returning. Wanting to help, the Guardian is tasked to join the other Guardians in pushing back the Darkness until a cure for the Traveler can be found. The Guardian ventures back to the Cosmodrome at the request of the Speaker who wants to know what the Fallen are protecting in the old Skywatch, but after infiltrating the Lunar Complex, the Guardian quickly discovers the Hive locked within before confronting the Wizard Gotra. Soon after, the Vanguard reports Fallen crews tearing into machines all over the Cosmodrome. Convinced they are not just looting, Ghost prompts the Guardian to investigate. The Guardian discovers the Warmind Rasputin survived the Collapse and is keeping the Fallen from accessing the Array. In an effort to raise this array, the Guardian tracks down access codes held by members of a lost Dead Orbit team. After fighting off the Hive, the Guardian reactivates the Array and Rasputin swiftly takes control, connecting with defense constructs across the system. On the Moon, the Guardian picks up the trail of another Guardian who went dark searching for a way into the Hive Fortress. After hacking a Golden Age colony base, the Guardian travels to the Temple of Crota where they fight off Exiled Fallen as well as Hive forces led by Vurok, Eir Spawn. Unable to save the Guardian, Ghost recovers his Ghost's memories and learns that the Hive are raising an army to invade Earth. In an attempt to uncover what the Hive are planning, the Guardian infiltrates the The World's Grave and kills Kranox, the Graven. The Guardian's Ghost then steals as much data as possible before the two return to warn the City. Returning to the Moon, the Guardian infiltrates the Hellmouth once more and claims the Sword of Crota. With its makers slain, the Sword shatters. While inside the Hellmouth, the Guardian follows a lead from the vanished Warlock Osiris, seeking the fabled Shrine of Oryx. After killing Frigoris, Exiled Baron and his Fallen crew, the Guardian defeats Sardok, Eye of Oryx and destroys the Shrine. After successfully decrypting the information from the World's Grave alongside the Cryptarchs, the Speaker broadcasts an urgent transmission to all Guardians claiming that a Hive ritual is draining the Traveler's Light. The Guardian then returns once more to the Hive temple and after receiving a message from the Exo Stranger, inviting them to come find her if they are successful, kills the Siphon Witches, effectively preventing them from stealing any more of the Light. Following the Stranger's coordinates, the Guardian finally travels to Venus where they are ambushed by the evil robots known as Vex. After defeating the Vex forces in the vicinity, the Guardian meets with the Exo Stranger, who tells them that they must find the Black Garden and rip out its heart in order for the Traveler to heal. Before the Guardian can ask anymore questions, the Exo Stranger is contacted by an unknown entity before dissolving. With the only ones who know the location of the Garden being the Awoken, the Guardian seeks an audience with the Queen of the Reef and is informed that they must obtain the eye of a Vex Gate Lord in order to infiltrate the Black Garden. The Queen then reminds the Guardian that they owe her in exchange for her information. To find a Gate Lord, the Guardian travels to an old research station of the Ishtar Collective, and analyzes a Vex mind core, giving them vital intel on the nature of the Vex as well as the means with which to summon the Gate Lord. While at the Ishtar Academy, the Guardian kills Grayliks, Winter Baron and secures an ancient Golden Age Archive for the Cryptarchs. Armed with this new intel, the Guardian reaches the Endless Steps, summoning and slaying Zydron, Gate Lord. Returning to the Reef, the Guardian brings the Gate Lord's head before the Queen, who gifts its eye to them in sympathy for their Traveler. Uldren then gives them the coordinates to the Black Garden including a way to repower the Gate Lord's dead eye. On Mars, the Guardian infiltrates a Cabal survey post and secures their research into the Vex Spire. The Guardian clears out the Cabal occupying the ruins of Freehold and explores what remains. Battling their way through a Cabal hardpoint, the Guardian reaches the Garden's Spire and kills Primus Sha'aul. While en route to the Garden, the Guardian also shuts down a series of Vex gates beneath the subway tunnels of Freehold, and discovers that the Vex are being summoned to protect the place where they were born. Succefully recharging Zydron's Eye, the Guardian is transported to the Black Garden. Within the Black Garden, the Guardian confronts the Sol Progeny and defeats them, destroying the Black Heart in the process. Returned to Mars upon the Heart's destruction, the Guardian is summoned back to the Tower, where the Speaker gives a victory speech. Meanwhile, the Exo Stranger converses with the Guardian inside the Hangar and gifts them with her Rifle before leaving abruptly again. The Guardian then repowers their ship and takes off into orbit as they prepare for their next mission. Ghost fought alongside The Guardian as they fought to stop Crota, Son of Oryx, Skolas, Kell of Kells, Oryx, the Taken King, and Aksis, Archon Prime. While out on Patrol, the Guardian and Ghost responded to emergency frequencies. Quickly returning to The Last City aboard a Hawk, they quickly discovered that the City had been invaded by the Cabal and aided in defending the Tower against the Red Legion. The duo managed to board Dominus Ghaul's flagship, The Immortal, seemingly destroying its shielding and several Red Legion commanders in the process. However, while attempting to escape, the duo was quickly confronted by Dominus Ghaul himself. As Ghaul spoke, the Traveler Cage was activated, forcibly removing the Light from the Guardian, and the Ghost in the process. 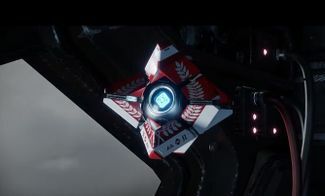 Ghost was instantaneously sent into a complete catatonic state and was kicked off of Ghaul's ship alongside the Guardian, seemingly to his death. However, Ghost somehow managed to survive, and regained the Light from the Shard of the Traveler in the European Dead Zone, living to fight another day. Ghost fought alongside the Guardian as they fought the Red Legion and reunited the Vanguard, being alongside them as they defeated Dominus Ghaul. While at the new Tower, Ghost and the Guardian are called by Ikora. Once they arrive she shows them the deactivated Sagira and tells them to reactivate her so as to learn if they can find Osiris. Once Ghost and the Guardian reach the location and the means to reactivate Sagira he is accidentally possessed by Sagira. For most of the campaign, Ghost is deactivated until Sagira's consciousness is captured by Panoptes, Infinite Mind and he thus regains his mind. Together, Ghost and the Guardian rescue Sagira, erase Panoptes, save Mercury, reunite Osiris and Ikora and prevent a Vex controlled future from occurring. Even so, Ghost didn't take lightly that Sagira "stole" his Guardian and possessed him. Ghost continues to hold a dislike towards Sagira when she comments on working together again, to which he tells her to leave his Guardian alone. Ghost is shown to be loyal and selfless, as he has stuck by The Guardian in some of their darkest times and has never hesitated to help others (his Guardian in particular). He is shown to care deeply for his Guardian as a friend, as he disregarded his own physical condition during the beginning of the Red War to heal his Guardian (who had been in a critical state at the time). He is genuinely glad that the Traveler chose The Guardian as his Risen. However, he seems to dislike going into harm's way; when the Guardian still talked regularly, it was generally their idea to go someplace dangerous. As their relationship evolved, the Guardian became more taciturn, generally allowing Ghost to speak for them. Though generally very chatty, Ghost is somewhat insecure and possessive; this may be due to the fact that it took him longer than usual to find the Guardian, and how he had begun losing hope before he had. When Sagira borrowed his shell out of necessity, it seemed to upset him more that his Guardian was working with a different Ghost than that his own body had been possessed. When Ana Bray called him "one of the uptight Ghosts", it elicited a laugh from the Guardian, who knew him best. The Drifter also observed that Ghost can be feisty. However, like his Guardian, Ghost does possess a dark side as he desired vengeance against Uldren and the Scorn for Cayde-6's murder, even agreeing to defy orders from Zavala to hunt them down. Ghost was serious and sullen during the hunt for the Scorn Barons, hardly being his usual chatty self. Despite this, Ghost did begin to question their mission to avenge Cayde as they got closer to their goal, finally stating that killing the weakened and powerless Uldren was wrong. I am a Ghost... well, actually, now, I'm your Ghost...you've been dead a long time, so you're going to see a lot of things you won't understand." "I hope you know how to use that thing." "Remember when I said you fly too fast? Forget I said that. Fly fast!" "Hold on to your helmet." "'Rar! I am a big scary monster!' Not when the Ghost and his Guardian are around! 'Oh no! You have defeated me! Ach!'" "Great job, partner! High five! Oh, right." "Look, on your right! A waterfall of Vex... milk. Yes, Vex milk." "Oh, look, look! Can't we stop and... aww." "Oh, this is strange. It feels like someones rearranged all the furniture in the house, except the house is my brain." Ghost speaking to The Guardian while en route to investigate the invasion of the Last City.